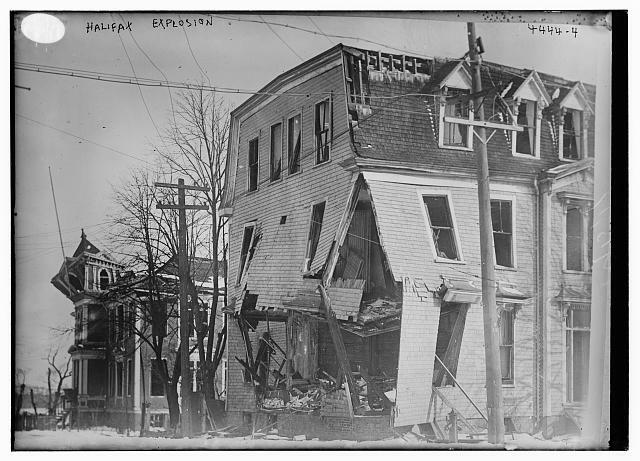 Many a disastrous events have taken place in history, the Halifax Explosion being one of the more horrifying events. With World War I risks were being taken and it was only a matter of time before something went wrong. It did, on December 6, 1917. The French crewed, slow moving SS Mont Blanc was carrying dangerous explosives to war torn Europe. She was to meet her convoy in Halifax. When the Mont Blanc arrived in Halifax on December 5, 1917, it was too late in the day to enter the Inner Harbor as anti-sub nets had been implemented (before the war it wasn’t customary for a ship carrying dangerous explosives to be allowed in the Inner Harbor. When carrying explosives the ships also flew red flags, but with U-boats lurking that would be suicide). They would have to wait till the next morning. In the Inner Harbor the SS Imo, crewed mainly by Norwegians and former White Star liner, was also faced with the same problem. There had been delays and she could no longer leave due to the nets. Labeled “Belgian Relief” this ship was to pick up supplies in New York and carry them to Europe. Without cargo she sat high in the water and proved difficult to steer. The Imo, commanded by Hakron From, took it’s pilot, William Hayes, aboard around 7:30 AM on the 6th. The Mont Blanc had started out earlier than the Imo and was headed into the Inner Harbour, piloted by Francis Mackey. This was Mont Blanc captain, Aime Le Medec’s first time carrying explosives, which were destined for France. He had heard that the TNT was especially dangerous, a sudden bump could cause them to explode. As the Imo pushed through the Narrows she encountered the stalwart tug Stella Maris. The tug noticed the quickly approaching Imo bearing down and had to ‘hug’ the shore. The Imo was in turn forced into the wrong shipping lane (for oncoming traffic). The Mont Blanc soon appeared and signaled to the Imo that she had the right-of-way. The Imo signaled back. When all was said and done the two ships had negotiated the Narrows and appeared to have had a ‘narrow shave’. But then the Imo reversed her engines and collided with the Mont Blanc. The collision caused sparks to fly inside of the Mont Blanc’s hull igniting explosive vapors. Le Medec had managed to avoid a collision with the hold that held the TNT. This would later buy time for the crew to get away, before the ship exploded. When the Imo yanked free of the Mont Blanc, the French vessel was sent drifting towards the pier. On the ship, fires had broken out and were proving impossible to put out. With the blaze quickly spreading and the ship able to blow up at any moment, Le Medec gave the order to abandon ship. Mackey had to convince Le Medec to leave his ship. The Stella Maris had detached her cargo and went to lend a hand to the Mont Blanc. The tug would be destroyed in the explosion while trying to tow the ship away. Other ships in the harbor had been carefully monitoring the development with curiosity. One sailor even theorized on whether or not the Mont Blanc might blow up as she was carrying explosives. As the Mont Blanc’s crew pulled for the shore, Mackey yelled to those in the harbor that the ship was going to explode, but his shouts went unheard. The crew managed to get to shelter among trees. Meanwhile crews worked to put the fire out aboard the Mont Blanc, but it was impossible. Explosions had begun and were becoming more powerful with each explosion. Disaster was imminent. At 9:04 AM an explosion rocked Halifax. Homes were demolished or collapsed, windows shattered, trees snapped. For people their wounds and deaths were horrifying. Eyesight was damaged, sometime permanently other times temporarily. A many an eardrum was busted. A massive cloud of smoke rose high above where the Mont Blanc had been and the blast could be heard from miles around. And then a tsunami hit sweeping hundreds of people out to sea. Traumatized survivors emerged from the wreckage of Halifax, the North End being the more badly damaged. The dead and dying were all around, everything much to gruesome to describe. For survivors one of their first thoughts was that the Germans had bombed Halifax. Schoolchildren, who had not been killed when their schools collapsed on them, rushed home to their families. Families tried pulling their loved ones out of the wreckage of their homes. Already fires were starting all over the place. Le Medec and his crew as well as Mackey came out alive, the two having crawled out from under a fallen tree. On the Imo, Hayes and From were both counted among the dead. With fires spreading, there were fears the magazine would explode. As a result police and soldiers worked to evacuate civilians causing a panic as people fled the area. Fortunately, soldiers were able to save the magazine. In Halifax efforts were being made to help the dead and dying. A central morgue was set up and the wounded began pouring into the hospitals. The constant stream of wounded kept doctors busy for long periods at a time. Because of so many, supplies were being quickly eaten away. When it was learned that they were low on morphine, some of the patients refused it preferring it go to someone who need it more. Soldiers passed out blankets and food was readily given. Boston was also sending medical personnel to aid the sufferers. The next morning a blizzard was beating down on the devastated city and would not end till that evening. Again soldiers were called on, this time to help patch up people’s homes so as to keep families warmer. Even amidst the blizzard corpses were retrieved and taken to the morgue to await identification. A Private Benjamin Henneberry thought he heard someone in the rubble of his home. He rounded up his comrades to help him dig through the ruins. Amazingly, they found a child who Henneberry thought was his 8 month old daughter. Further searching showed that his wife and five children were dead. Later Henneberry’s daughter was found to be Annie Liggins, an 18-month old girl. Her relatives found her and informed Henneberry about this fact. By the end of the day the blizzard had done its deed. In the end Halifax rebuilt and tried to return to their normal lives. A later inquiry claimed that Le Medec and Mackey were to blame for the collision, but in 1919 both the Mont Blanc and Imo were blamed. The Imo ran aground in 1921 and lost. YES!!! One of the most interesting events in Canadian history, tragic though it was. I’m told one piece of the Mont Blanc landed several miles away in one direction and another landed miles away in the other direction. It’s a miracle anybody survived at all. And I’m proud of Boston. They sent lots of aid and still get a Christmas tree to this day from Halifax as a thank-you. Yes, in her book Curse of the Narrows MacDonald wrote about the tree to Boston. It’s very interesting how they’ve kept the memory alive still yet and express their gratitude to Boston. The explosion must have been truly horrendous. What you said about the Mont Blanc, a wounded man was said to have a part of the ship stuck in him when the small piece went flying through the air. 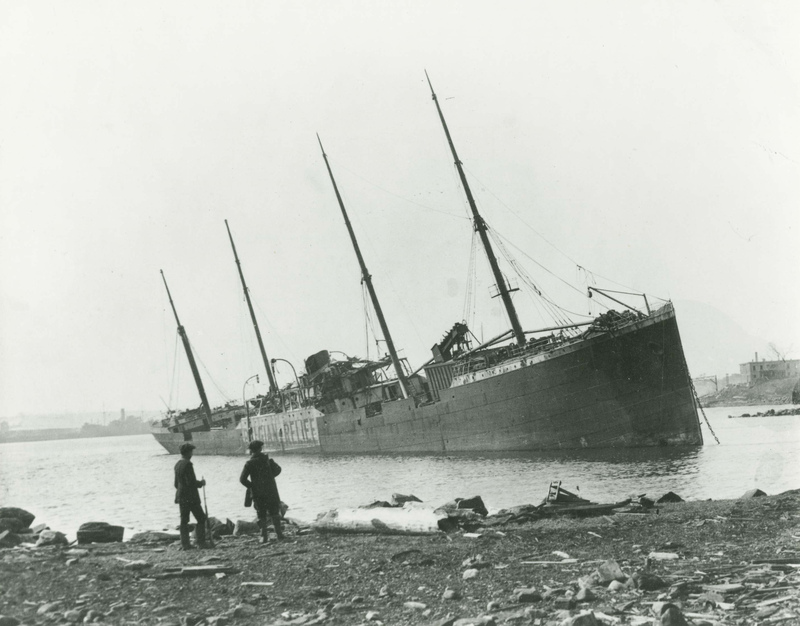 One of the most harrowing aspects of the disaster was that after the two ships collided many individuals came down to the waterfront to witness the aftermath. When the Mont Blanc exploded, most were either killed or wounded, with many of the latter blinded. An excellent work of fiction that uses the Halifax explosion as its basis is a “Barometer Rising” by Hugh Maclennan. It’s a great read. Very awful. I’m even more amazed that a fireman who was with the Patricia survived while all his comrades died in the explosion. He was very near the Mont Blanc. Then of course there’s the case of the Stella Marris where 5 survived, out of 34. To be in such close vicinity of the Mont Blanc and come out alive is a miracle. I’m off to give that book a look see. Thanks for your comment. I had already heard of this story, but not in detail. The Mont Blanc’s explodes is really impressive!! What a tragedy. And the snow just after that! It was a cruel combination of circumstances. Yes it was. Everything combined made it much more difficult on the survivors, with the explosion, tsunami, fires and then the blizzard. MacDonald also mentioned some tornadoes springing up. I wonder if any people who had survived the explosion died in the awful aftermath? What a story! Being from the western United States I had never heard of this event. Thanks so much for sharing. It is very interesting, but can’t say that I’d recommend MacDonald’s book. Having seen several mentions of this event in other books (non-related) I decided it was time to get a post together. What another horrible event in history! Though I must say, the most horrible usually prove to be the most interesting. By the way, do you know how many fatalities were caused by this explosion? Oh, yes I don’t know how I overlooked that. In the end about 2000 people were killed (numerous animals also died, the horses pulling the fire engine Patricia for one). According to Wikipedia 1600 died following the line of disasters. I think about 9000 were wounded/injured, those injuries being unspeakable. Mmm… that’s just a terrible amount of deaths, plus all the injured. It’s hard to think of all the families that were emotionally wounded, simply because they lost someone in that explosion. Very heartbreaking. A sister determined to find her brother lost in the rubbish of the family home enlisted the help of some soldiers. They found him, but it was too late. I wonder perhaps if he had been alive in the aftermath of the explosion only to succumb to the blizzard. He was, after all, found after the blizzard. Very sad stories. I have heard of this event, but not so much detail, so this is a really good read. I am sadden by all the deaths and injured. 😦 Planning a trip back to Canada for next year (maybe…since I am also planning to go elsewhere, so may have to bump it down), so Halifax might be a good site to visit and plus I haven’t been to Nova Scotia yet. Yes, it’s a tragedy when any person is lost in a tragedy, it’s even worse when 2,000 are counted among the lost. Halifax sounds like a wonderful place to visit. With the Explosion and it’s Titanic connection it has alot of history wrapped around it. Plus I think many Tory/Loyalists fled to Nova Scotia during and after the Revolution. Nr. 50 in the list. I’ll give it a look, thanks for the link. Happy you liked the post. Thanks for reading and for your comment! What a horrible story. Poor Private Henneberry. Yes it was very dad for him. But he had planned on giving the child to another family since he would not be able to properly care for her. Since it turned out to be Liggins I wonder what happened to Henneberry’s baby. Perhaps lost in the rubble of the home. What a terrible story, I had not heard of this before. The poor people, not only affected by the explosion and the wave, but to have a blizzard right afterwards. I imagine that many died in the rubble of their homes who would have otherwise survived. Yes it was. It’s almost like an event out of science fiction the way all the calamities just hit Halifax at once. Thanks for your comment! A sad tale, well told. I will share this with my Canadian husband. Yes it was very sad. I believe up until Hiroshima this was the largest man-made (even if it was an accident) explosion. If you’re interested, please check out my own blog. http://thisiswarblog.wordpress.com. Thank you, glad you liked it. I’ll check out the link you sent and also I’ve checked out your blog. It’s very interesting. Excellent article as always. Been absent for a while and was pleased to see this when I returned. Have you see Shattered City, the movie (originally mini-series, I think) about this incident? While not fully historically accurate (what movie ever is?) I thought it gave a sense of the look and feel of what it must have been like. Anyway, keep up the good work. Thanks, I really enjoyed you article from yesterday, as well. No, I haven’t seen it, but I did read an article about it on Wikipedia. It sounds interesting. A tragic event with so many people caught up in it. Thanks for posting. Indeed, it was a terrible tragedy. Thanks much for your comment.